Seattle Gay News is excited to announce low introductory airfare on Lufthansa with direct Seattle-Frankfurt service at $347 (one-way). Tickets must be purchased by March 7, and travel dates must be anytime between March 30 through May 15, 2008. Tickets can be purchased at http://www.lufthansa.com/, Lufthansa reservations (800-645-3880), or via preferred travel agent. Quoted fares are for Economy class only. From Frankfurt, you can connect to 192 alternate destinations in 78 countries via Lufthansa including 22 North American gateways (as of April 2008). New direct service from Seattle-Frankfurt begins March 30, 2008 with daily non-stop flights departing at 2:30pm with arrival at 9:25am (local Frankfurt time, next day). The return flight departs at 11:15am with arrival at 12:30pm (Seattle time, same day). In-flight service aboard Lufthansa in Economy class will feature new personal entertainment screens. This is a fantastic opportunity for anyone wishing to visit Germany or Europe this spring. 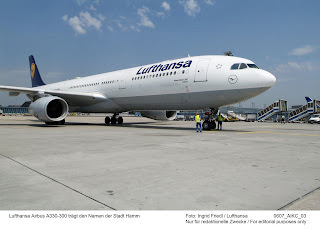 For more information, visit http://www.lufthansa.com/ or consult with a travel agent. Do not contact the Seattle Gay News office, as this is the only information we have at this time. Have a great trip, and don't forget to grab a copy of Seattle Gay News on March 14 for our special travel edition.